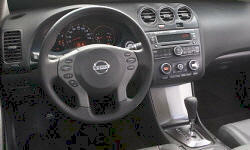 Why the 2007 Nissan Altima? This car has excellent acceleration considering it is a hybrid. The car performs exceptionally well at freeway speeds also. There is quite a bit of engine noise on hard acceleration however due to the CVT transmission characteristics. My previous experience with owning 2 prior Nissans has been excellent with nothing other than very minor repairs required. I have driven the car over 15000 miles since last July with no repairs needed. Excellent warranty for the hybrid model also. The exterior styling is attractive and up-to-date with flowing lines and nice rounded ends at the front and rear lights. The car is quite a bit larger than previous versions of this model and is much more attractive than the new Accord. The Altima Hybrid has a regenerative braking system with standard ABS, traction control and stability control to make a very good handling sedan. The car rates highly in government safety tests and has nice, short stopping distances for its size. 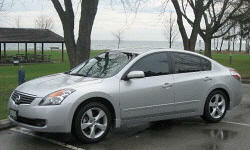 Why Not the 2007 Nissan Altima? I was quite dissatisfied with my treatment at this particular dealer. I felt that they were not very professional and tried on several occasions to give me bad information regarding the actual cost of the car and my financing. The hybrid battery pack consumes a good bit of the otherwise large Altima sedan trunk capacity but it has never been an issue for me personally. Also I never need to tow anything so that is not really a concern for me either.